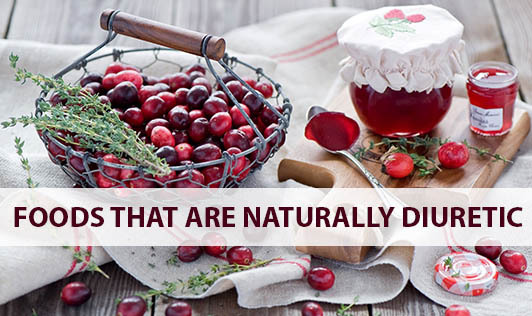 Diuretics, whether natural or synthetic, helps to get rid of the body's excess water by increasing urination. 1.Fruits- Pineapples, tomatoes, melons, cranberries and grapes. In addition, many fruits share a high water content that can remove excess water from the body. 2.Vegetables - Onions, cucumbers, celery, parsley, asparagus, garlic, cabbage, radish, beans and pumpkins are said to have a good diuretic effect. 3.Herbs - Certain herbs like dandelion, ginger and juniper are known for its natural diuretic properties. 4.Cereals - Oats is known to contain silica, which is a natural diuretic. 5.Caffeinated foods - Foods such as chocolate, soda, tea and coffee are potent natural diuretics. However, water retention can be caused by a number of medical conditions like diabetes, kidney, liver disorders and heart ailments like high blood pressure, pre menstrual bloating and as a side effect of some medications. So, it's important to discuss with your doctor about possible causes of water retention before trying to treat it yourself. Otherwise, it can result in reduction of body fluids that may lead to dehydration and also disturb the body's balance of minerals and electrolytes.